The Redskins Cheerleaders Final Auditions show is open to the public! Come out to the Bethesda Theatre on Thursday, April 1, at 7:30 p.m. ET to watch first-hand what it takes to make the Redskins Cheerleaders squad! Doors open at 6:30 p.m. General admission tickets are $15 and VIP tickets are $25. The Final Auditions show features the finalists competing for one of the coveted 40 spots to become one of the "First Ladies of Football." "It’s a chance for fans to get a behind-the-scenes look at what a professional audition is like and to also root for their favorite cheerleader," said Stephanie Jojokian, Redskins Cheerleaders Director and Choreographer. Each year, the Redskins Cheerleader staff strives to raise the bar to continue to be among the top cheerleading squads in the country. Cheerleader candidates will be judged on their appearance, performance in dance routines, ability to entertain and photogenic ability. Cheerleaders get the opportunity to perform at Redskins games, travel the world for appearances and participate in the annual swimsuit calendar photo shoot. The Final Auditions show is sponsored by Robert Andrew Day Spa & Salon. The Venetian now offers in-gaming wagers using Pocket Casino. 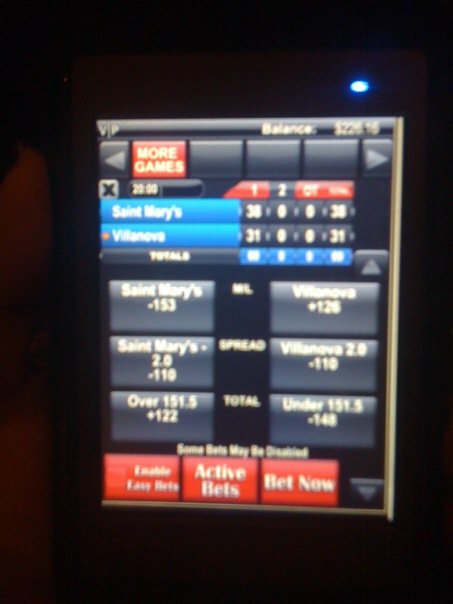 It's a hand-held device that lets people wager on fluctuating money lines, over/unders, for halves and for the game (i.e. the odds are ALWAYS changing). 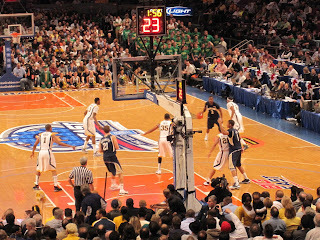 People can also wager on whether free throws are made or missed (e.g. 0-2, 1-2, 2-2). Not all bets are available at all times and to reiterate the odds and spreads change constantly. Therefore, you have to be quick to place and confirm your bets. In order to use the machine, you must complete and application form and have a Grazie (i.e. Palazzo and/or Venetian loyalty card). Once approved you deposit cash with a Supervisor and for a limited time you also receive a $20 credit. For all you "Bad luck, Bettys/Bobs" out there ~ since you're using cash and not credit, you have a limit as to how much you can lose. You can hedge your bets off the board, with your in-gaming wagers if you're quick and savvy, since you can take advantage of momentum shifts, injuries, and fouls. Minimum bet is $5. I have no idea what the minimum sportsbook bet since I don't bet on horses. ****OK ~ I'll admit that I have bet on horses once, and I won about $26. However, I would NEVER be caught placing a $5 wager on any sporting event at a counter. For a good free-throw shooting team, you can easily make some money and put your money where your mouth is as to whether the player makes/misses the shot. 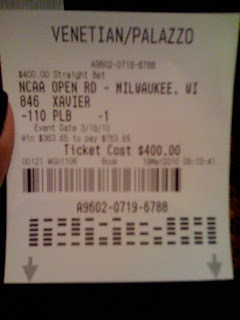 When I was up $100, I quickly found myself betting $20/$50 a free throw (i.e. of course, the payout isn't 1:1, but a profit is a profit). The machines only work in designated gaming areas and there's a map on the pamphlet that specifies the areas in the casino. The hand-held is glitchy and makes you login with your Grazie number and a password when it loses its connection. The battery life for the device isn't that great. I'd estimate 1-2 hours if you constantly bet and/or the screen is illuminated. Since the battery life isn't that long, you will have to exchange your machine repeatedly. You don't need to wait in line for this, but depending on demand for the device ~ your new machine may not be fully-charged when you receive it. Unfortunately, the machines don't charge as quickly as they're swapped in and out. Not all games are available on the device. I'm not sure how games are chosen, but I do know that I wanted to wager on the Kansas game, and it wasn't available. The only sport that was available and active, was college basketball. However, if I remember correctly professional basketball and hockey etc, were listed as options ~ so it does look like the functionality will be expanded. The Supervisor Pocket Casino will serve as the primary access point in meeting the needs of the guests and the pocketcasino ambassadors. This may include telemarketing, intense guest interactions to resolve service breakdowns and promote guest recovery and player analysis. All duties are to be performed in accordance within departmental and The Venetian Casino Resort’s policies, practices, and procedures. Roam the casino floor, pool deck and sports bar in varying hot or cold conditions. Be competent with MS Excel, MS Word, Outlook. Own a high level of confidence in learning additional software and hardware pieces as needed. Must be personable and able to effectively move guest service disputes toward resolution and guest recovery. Owning and resolving guest service issues including those not directly involved with pocketcasino dept. Monitoring the performance of pocketcasino ambassadors in the casino, pool and sportbook areas to ensure 5-diamond service is consistent. Moderate technical assistance with pocketcasino devices and computer systems. Monitoring and interacting with external marketing devices, agencies, and their employees. Ensuring appropriate levels of supplies are maintained in the department including marketing collateral, general office supplies and other tools as needed. Maintaining, tracking and monitoring of all funds accountability to the pocketcasino ambassadors. Must be confident and assertive in coaching and counseling ambassadors as needed to ensure performance and service levels are maintained. 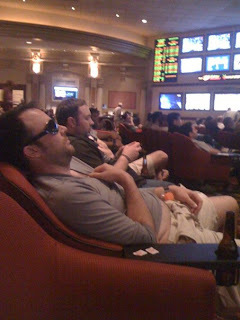 Moral of the story, if you're in the Venetian sportsbook or a designated gaming area and you're a patient person (i.e. 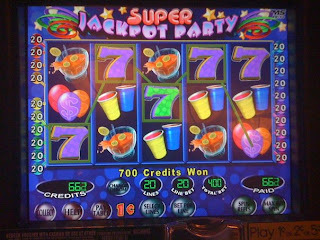 you have to deal with the technological issues), check out Pocket Casino. Seriously... What do you have to lose?!?! 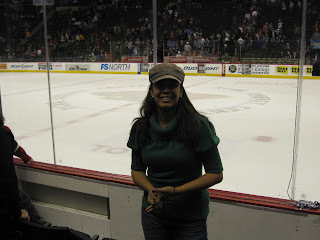 Tuesday night I went to the Xcel Energy Center to check out the San Jose Sharks v the Minnesota Wild. I wore a green sweater to work, so I was practically already dressed to support the Wild ~ BUT I was there to root for the Sharks (i.e. and check out another venue, #61 to be exact). I talked to the hotel concierge and found out that St. Paul is about 15/20 mins away from Minneapolis. He also informed me that scalping is legal here. Bingo! I threw my boots on and hopped in a cab. 20 mins later, I stepped out of the cab, found a scalper and he was more than willing to split a pair of tickets. He had tickets 4 rows off the ice, located more or less "center ice". Face value on the ticket was $80+. I paid $60 and waltzed into the arena. 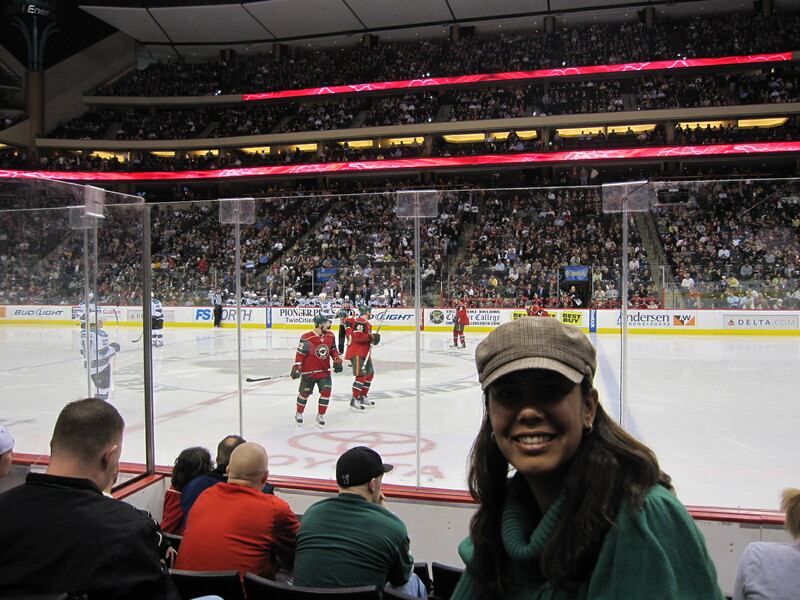 Why not root for the Wild? I have no loyalty towards Minnesota. 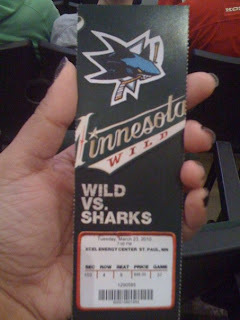 Actually, I really don't have any allegiance to the Sharks either. However, I do remember meeting George Gund III at the Cleveland Cavaliers' holiday party many, many years ago and I recall that he held a minority interest in the team, until 2002. 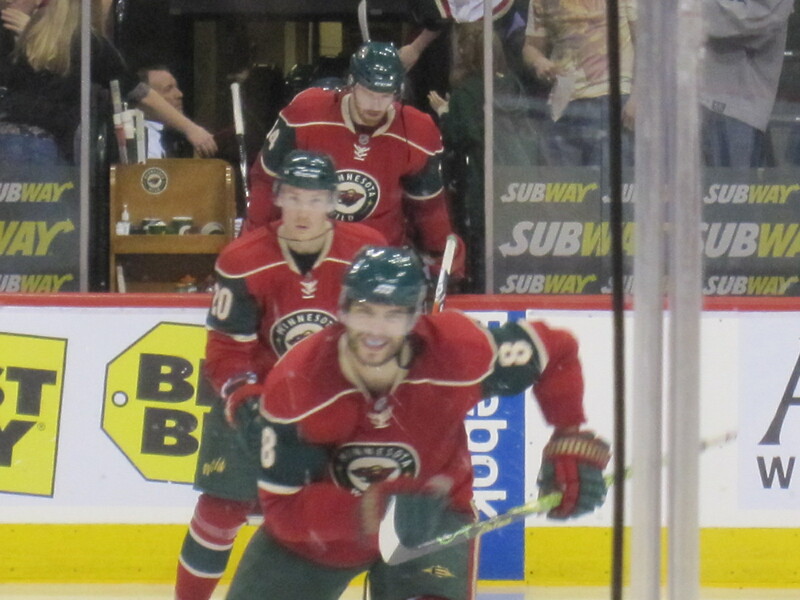 I like the Gunds. They are Cleveland natives. 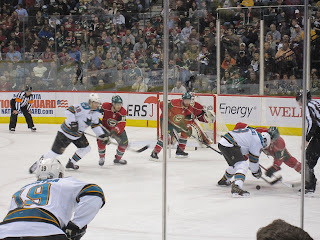 Further, it didn't hurt that I checked the standings before I left the hotel and the San Jose Sharks have been on a 5 game losing streak, so it was "time" for them to win. I like rooting for winners. When I arrived at the arena, I ran to my seat. I noticed the Sausage Haus and mini-donuts were for sale. 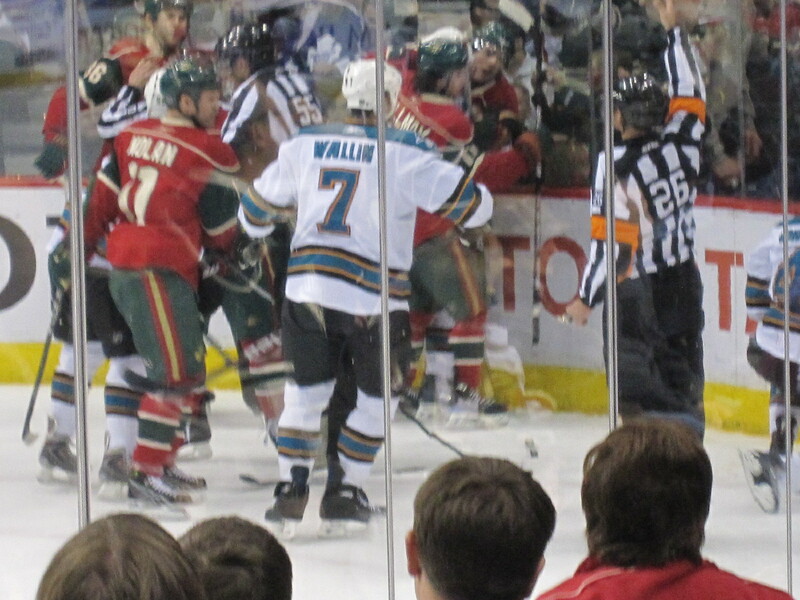 No time for that though ~ I wanted to be in my seat for the opening face-off. My seat was excellent. 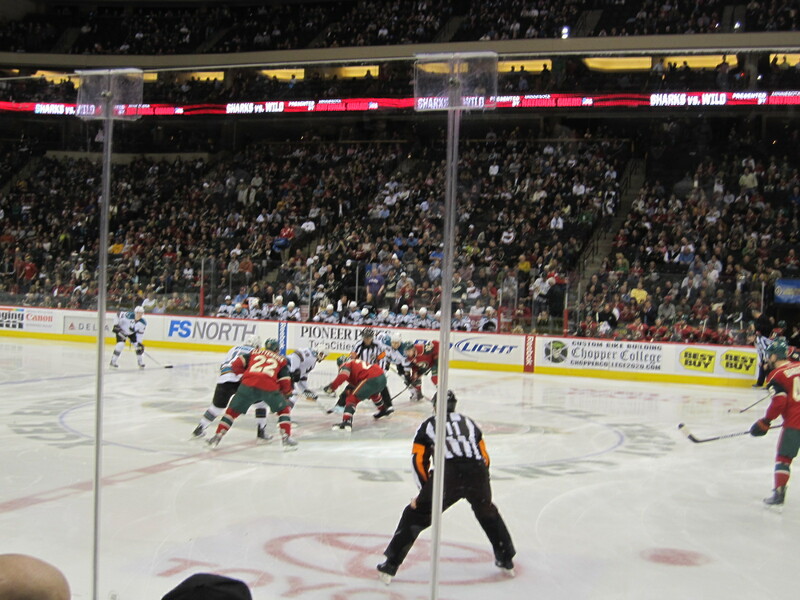 The Minnesota Wild are out of the playoff hunt, but they drew a crowd of 18K+ . There was much more energy at the Xcel Energy Center (i.e. 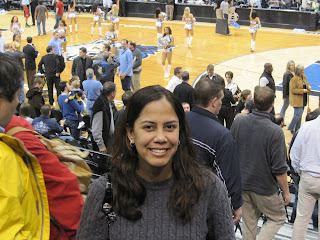 no pun intended) compared to the Target Center. 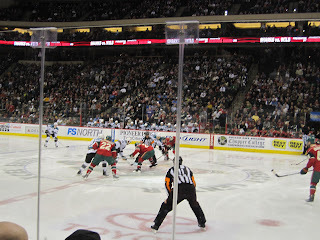 However, towards the end of the game, it appeared that the crowd began to turn on their home team as one of the guys sitting near me started referring to them as the Minnesota "Mild". 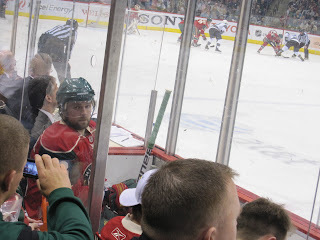 This was a very aggressive game and lucky for me, I was sitting close to the ice and near the penalty box. 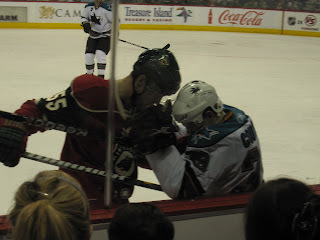 The Sharks won this game easily, with a score of 4-1. There's really nothing left to say. The Sharks were clearly the better team. I only need to hit the new Minnesota Twins' stadium and my sports tour of this city will be over. Incidentally, Darth Vader was at the game and riding on the Zamboni. I think he was also posing for pics with some Storm Troopers on the concourse. There's some sort of show that will be performing songs from the movie at the arena at a future date. My one regret of this night, is that I did not seek out Darth for a picture. Oh well ~ I'm not worried about it. With my luck, I'll run into him again. Further, there was a contest during one of the breaks in the game and 1 male and 1 female were competing to identify the Star Wars characters' pictures that appeared on the big screen. Now I don't know where these people came from or what rock they've been living under, but who can't identify an Ewok, C3PO and R2D2?!?! 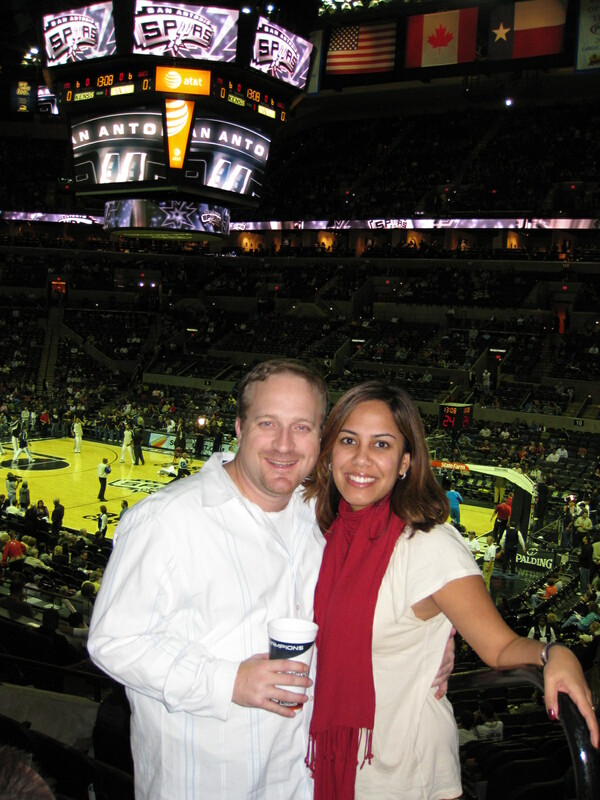 Answer: the 1 male and 1 female who agreed to participate in the game. It was unbelievable. 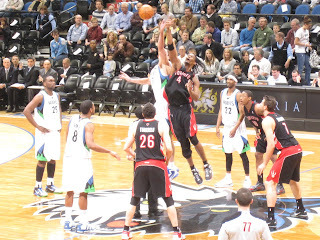 Monday night I went to the Target Center to watch the Toronto Raptors take on the Minnesota Timberwolves. I also crossed off my 60th venue in my goal to hit all the professional stadiums for baseball, basketball, football (and I guess I'm also including hockey). I knew the game wasn't going to be a barn burner, but I had to go to the arena and check it out for myself. I knew ahead of time that this arena was older. I also knew that, years ago, this is the arena where a ceiling light fell and almost hit Zydrunas Ilgauskas. How do I know? He told me. Needless to say, I kept looking up to make sure everything was all good. 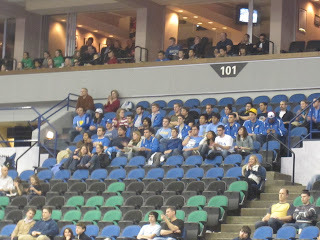 The Target Center is an older arena conveniently located right downtown in Minneapolis. 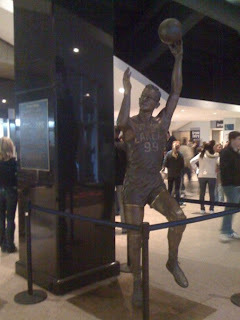 When I walked into the building, the first thing I noticed was a statue of "Mr. Basketball" George Mikan. 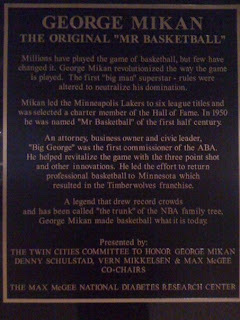 For those of you that don't know who George Mikan is, you really should go out and buy a basketball almanac. He is a legend. 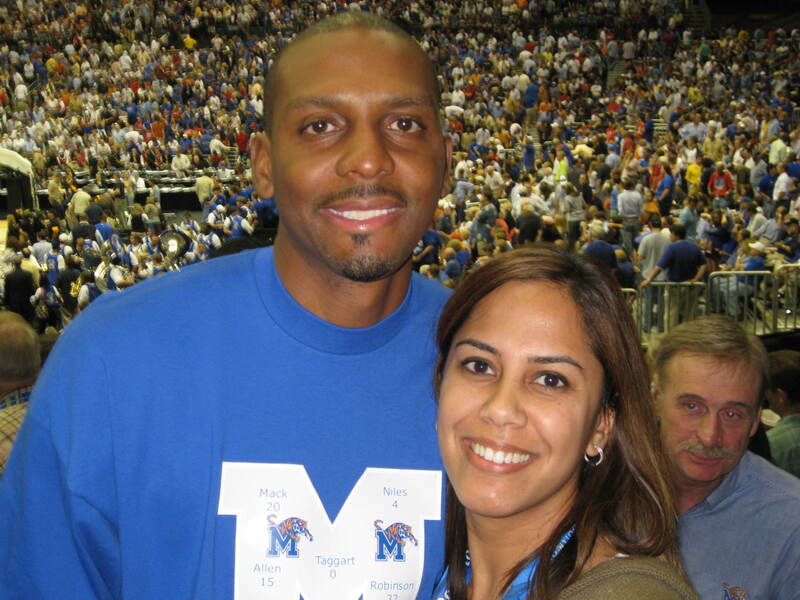 I met him years ago, when he was in Cleveland for the NBA All-Star game. I'm pretty sure I have his autograph somewhere on something, and I'm even more confident that the item is gone. Oh well. My seat was 10 rows off the court in front of the Timberwolves' bench, and immediately I looked towards the rafters to see what was up there. 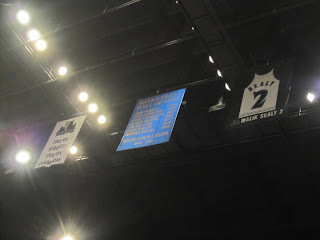 On a lighter note, the center banner boasts the Minneapolis Lakers' Basketball Hall of Fame. The game started, and I noticed that it was really quiet in the arena. Really quiet. 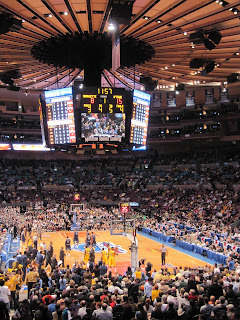 It reminded me of Gund Arena before LeBron came on the scene, and Gund Arena (i.e. before LeBron came on the scene) reminded me at times of a library. ****Incidentally, it reminded me of one of the girlfriends of a former Cleveland Cav, since she could often be seen reading a book, in her seat while her man "played" the game. Talk about rude and embarrassing. I'm all for promoting literacy, but that can be done in the family lounge or at home if you're that disinterested in the game. It's almost like a mentorship program for the young Timberwolves'. I looked at the players and noticed how young they are. I think that explains their record. Kevin Love had a decent contingency from UCLA in the arena, to the point where I thought there was a legitimate student section and I was at a college basketball tournament game. Ok. now this is going to seem mean, but I can't not say anything about it. 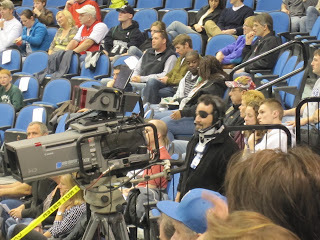 The camera man for the Timberwolves must have been in a bad car accident. He was wearing a neck brace and had an eye patch. Talk about dedication to his job, because there he was doing his job. 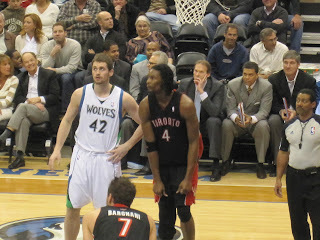 During the game, I noticed that Marc Iavaroni was sitting on the bench for the Toronto Raptors. I remember him from his days in Cleveland where he served as the Big Man coach. It's always great to see a familiar face. 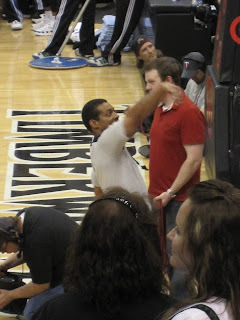 During one of the timeouts, the Timberwolves had a promotion where they threw T-shirts into the crowd. Have you ever seen a referee throw a t-shirt into the crowd? I never had until this game. 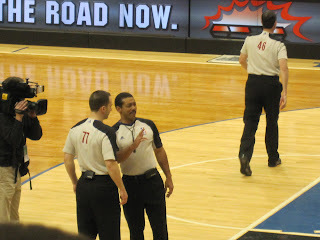 Maybe I've never really paid attention, but I always seen the refs talk amongst themselves during these timeouts ~ however, at this game I noticed one ref scanning the crowd for where to throw the T-shirt. Weird. Seriously?!?! 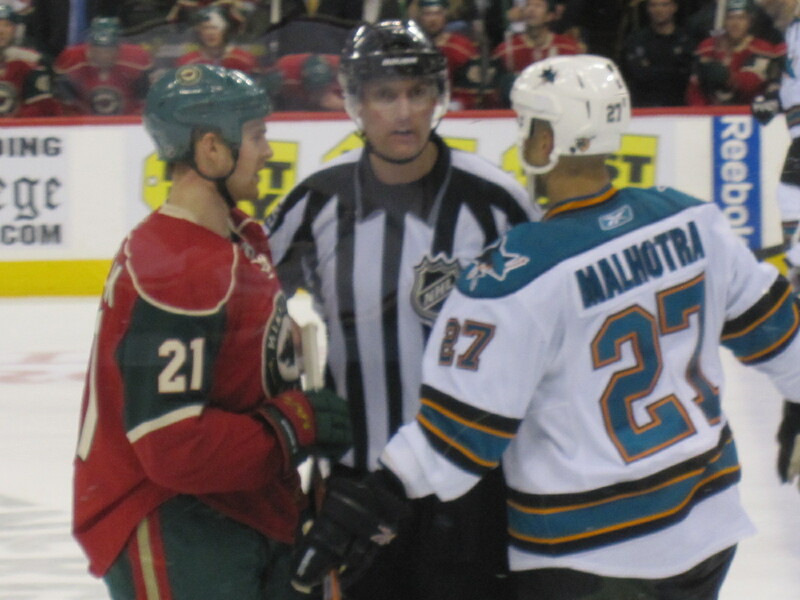 Is this ref from Minnesota? Weird. Anyway, nothing much to report about the game itself. It was a slow one, but the Raptors came back to win by 6 points (i.e. Jack was fouled with very little time left in the game). 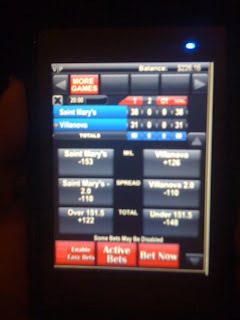 The betting line was -4.5. Just saying. The Target Center has vendors that sell snowcones and beer will run you $6.75. I had Twizzlers and a Pepsi while I chatted it up with the guy sitting next to me, who happened to be Ramon Session's cousin. I'm in Minneapolis for work and need to rest up before I head out to the Target Center tonight. It'll be the 60th venue for professional sports that I'm hitting (i.e. 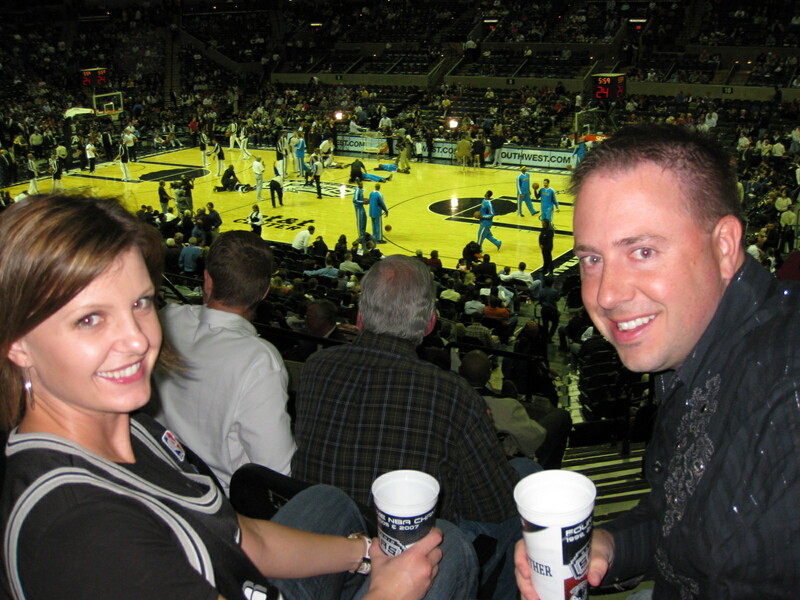 I have a goal of hitting all the venues for basketball, football, and baseball). Hopefully I don't fall asleep during the game, with all the traveling I've been doing today. While trying to decompress from my 16 hour airport "crawl" (LAS, ATL, DCA, and MSP), I am in my room watching The Office re-runs and googling my name to see what comes up. I'm excited to report that NBC Washington added the video clip of me talking hockey, after the USA v Canada gold medal hockey game, to their story. They actually cut the other 2 guys out! For those of you that missed it, attached is the link to the story and video. The entire video is here in a post (i.e. check the February archives of this blog). I don't even want to talk about March Madness and brackets. I can't believe my eyes and hope that when I wake up it's all a bad dream. 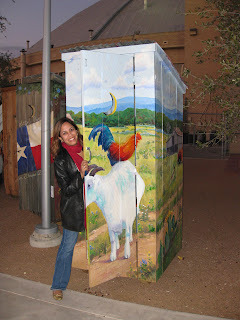 On another note ~ for those of us that are fans of Rapid Roullette, check out Rapid Craps... According to its website, it's only at Bill's Gamblin' Hall & Saloon. I stumbled upon it today and fell in love. Each player has his own terminal and there's a $5 minimum. For those of us that are anti-100% machine for gambling, you'll be happy to know that a human throws the dice and the dice move around the table normally. Now, beginners don't have to be scared and call out their bets anymore, players don't have to worry about not being paid out properly, and dealers don't have to worry about people throwing chips at them. Everyone "wins" (i.e. actually, maybe not everyone ~ the technology might put some dealers out of work). Ever heard of http://www.goldentouchcraps.com/? Now you can take classes that teach you "dice control". Um yeah... 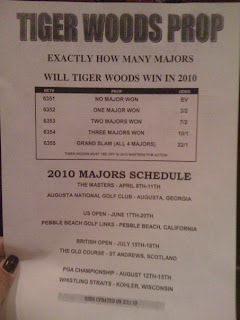 I don't know, but just in case you're interested: http://www.goldentouchcraps.com/midastouch.shtml. Personally, I NEVER touch the dice. Back in the days, when I'd hit the Bahamas, I determined I just don't have the "touch", so if you're ever playing craps with me and it's my "turn" to shoot ~ let me pass. Trust me, I'm cute, but can't shoot. 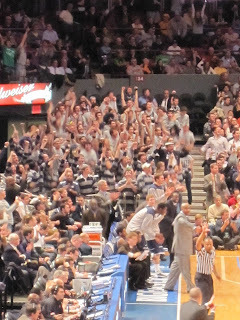 I went to the Big East tourney last Friday and sat next to 4 ladies. 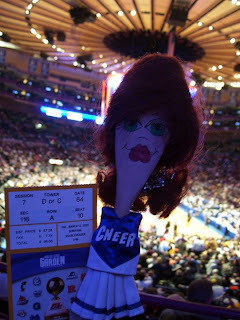 Actually, I should correct that and say "5" ladies, since SpoonEllen was there. Do any of you know who SpoonEllen is? Well, you should. Chances are she's doing things that are much cooler than you, and (to be honest) she probably dresses better than you and Flat Stanley. SpoonEllen, from what I've observed, likes comedy, loves to travel, is a philanthropist, attends book signings, and appreciates the arts and sports. She's is definitely no one trick pony. I peeped her photo gallery, and I noticed that she'd been to the US Open. The Wirk has yet to be make it to Flushing Meadows for the tournament... Not only has SpoonEllen bested me with that event, she has met tennis great, Billie Jean King! Are you serious?!?! I'm officially jealous. SpoonEllen is "living the dream" and doing it ever so stylishly! If you like, what you see ~ check out her website: http://www.spoonellen.com/ or her facebook page. Saturday morning I left NYC and took the train to Atlantic City (http://www.acestrain.com/) for the Jay-Z concert. 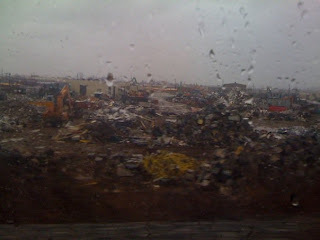 This was my first time on the train from NY Penn Station to Atlantic City (i.e. 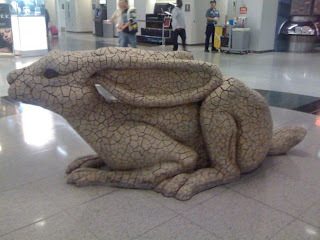 quick stop in Newark, but I think it was only due to scheduled maintenance). The fare was only $29. You can't beat the price. The ride is was about 3 hours, but I slept most of the way. Trash, but seriously... Who cares about the view? I just needed to get to AC. Close to 12:30 PM the train arrived at the AC train station (i.e. 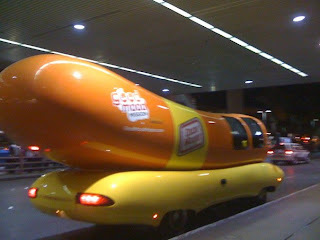 which appears to be connected to the Convention Center and is located near the Sheraton). From the station you can hop on the jitney and for $2.25, it will take you to your destination. 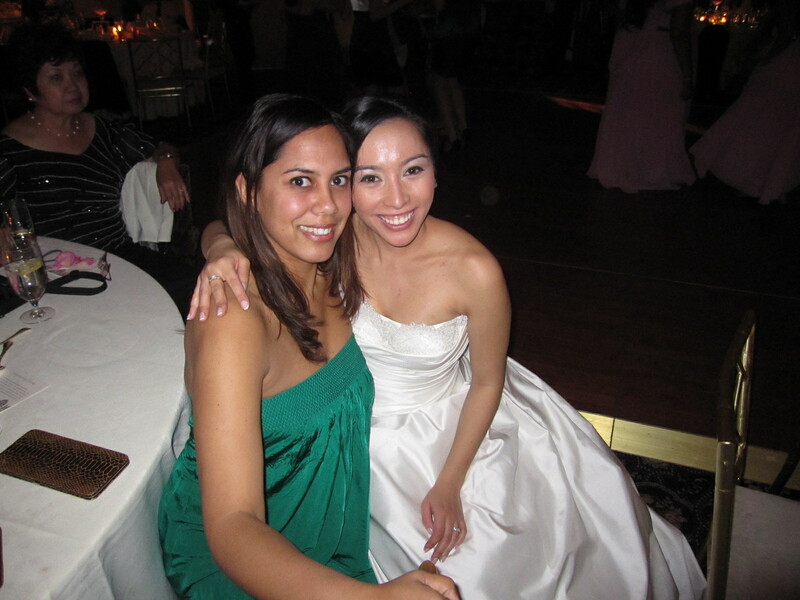 I was meeting a couple of friends in AC, and they were driving from DC. They started their voyage earlier than me, and had beaten me to AC by 10 mins or else I would've asked them to pick me up. 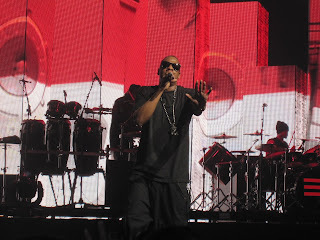 The main reason I headed to AC was to see Jay-Z, at the Borgata. I like the Borgata and had a reservation there, but my friends offered to let me crash with them at Caesars so I cancelled my hotel room. I like casino comps. 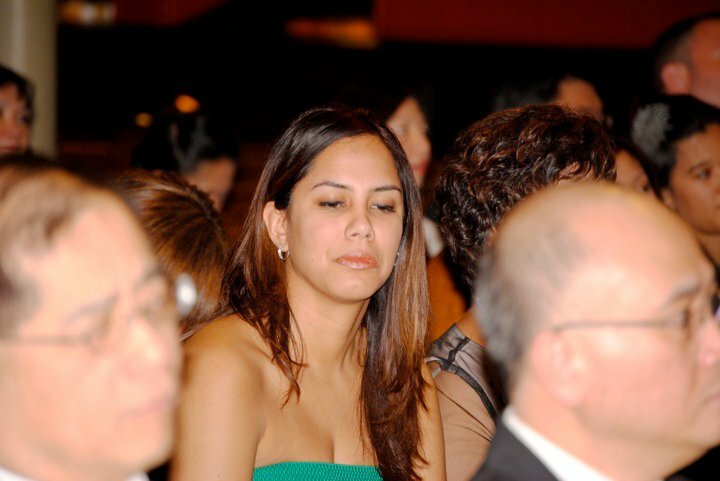 This wasn't a clubbing type trip ~ this was mainly business (i.e. there to gamble). My friends like to gamble, and we all were "in it to win it". Plus, I knew I'd have my chance to sing and dance at the concert, so it wasn't that serious for me to be in the thick of it all at the Borgata's clubs (e.g. Mixx or mur.mur). Next, my friend and I headed to the roulette machine, and I dropped another $20. I asked my friend, "Are you having fun yet? Because I'm having a blast..." Yep, I was starting to get sour. I don't like machines and all the "games" that have no human interaction. As far as I'm concerned those things are developed and programmed by sadistic, computer/math nerds that don't want anyone to win. It's just a hunch. What do I know? I played some other game and dropped $100. I had so much fun losing that hundred, that I couldn't tell you what game I had played (i.e. sarcasm). My friend suggested we go eat. I thought to myself, "Yeah. Food. Eating is cheap". So we went to some lounge restaurant and ordered a pizza. While trying to wake up (i.e. I was still tired from staying up late the night before trying to finish my Big East posting) and watching conference tourney games on TV, I knew that the inevitable was about to happen. I was going to have to go to the ATM. It takes money to make money, and I only had $121 left in my wallet (i.e. after scalping the ticket the night before to the game and squandering it on 2 machines and a table game). My friend bought lunch, and I walked with my head down to the ATM. Sooooo, I'm standing in front of the ATM, and I realize that I have no idea what my daily limit is on my account. I try to pull $600. ****Ok, if you're reading this, you should know that I'm NOT a high stakes casino player. I have always been a money hoarder. Ask anyone in my family. I went for that amount because I have another trip coming up, and I wanted to pull enough to make the ATM fee "worth it". I tried for $600, and I was denied. Obviously, $600 is over my daily limit. Next I tried for $500. Yep, you guessed it. Evidently, my bank had decided that I was not pulling that much out of my account either. Denied AGAIN. At that point, I was positive that the guy behind me thought I was a lunatic and/or poor and wanted me to get out of line. Whatever. He was going to have to wait. As they say, the 3rd time was the charm, and I successfully withdrew $400 out of my account. EUREKA ~ finally I had money!!! My friends started playing Pai gow poker, and I headed to Rapid Roulette. I turned $100 into about $350 in about 15 minutes. It's called "Rapid" for a reason. For those of you that have no idea, what I'm talking about, here's a quick summary. Rapid Roulette has about 12 stations and each person has his/her own screen where he/she can place bets (i.e. the minimum bet is usually less than the actual tables). Then beauty of the game, is that a HUMAN spins. Like I said earlier, I don't mind automation and technology, but appreciate the variability of human interaction. I went back to the lounge area where my friends are and show them my chips. I'd decided that maybe one of my friends is a cooler. I said maybe. I'm not sure. Regardless, I told him he was not allowed to gamble for a while until I got my groove back. At the craps table, things start moving and sure enough, I started to make some more money. My dad taught me craps. It was a bonding experience for us when I was younger. We'd go to the Bahamas, and I'd always approach him at the craps table when I was bored/hungry. He's funny when he's at the craps table because there are times when he doesn't want anyone near him. To get me to leave the table he'd always give me chips out of his rack to go "cash at the cage". This is good work, if you can get it. When I was younger, it worked like this. I'd get bored and look at my dad's chips. If he didn't have many, I'd wait to approach him later. If he had a bunch, I'd go over. Timing is everything. Sure enough, within about 10 minutes, I'd have a handful of chips to cash. Once I got the cash I'd run back from the cage and hand the money to my dad. My dad likes hundreds (i.e. like father, like daughter). If I brought him $687, I'd get $87. If I brought him $493, I collected $93. You get the point. I'd make about 10 runs a weekend. So, here's the story. One year my brother and I were with my dad on the way to Windsor from Detroit. Dad asked both of us how much money we had on us, so he could borrow it. He hates ATM fees too. My brother informed my dad that he had about $40. I reported that I had $1,300. When my brother heard this is head spun around he started yelling "foul". My response was to tell him to go to the Bahamas, because it's lucrative and fun. ****Told you I was a money hoarder. Before you knew it, it was almost 5PM, and I'd planned on going over to the Borgata by 7 to get into the Event Center. ****My ticket for the concert was a Standing Room Only/General Admission one because I wanted to be able to be up by the stage. I prefer to play craps when I have a schedule, because it forces me to have to walk away at some point. It keeps me disciplined. I left the table, got ready, and went back down to the casino to see my friends, who decided that they might head over to the Borgata later. At the Borgata it was a mad house, but in a good way. People were everywhere and you could feel the energy. It's a great hotel. I went straight to the event center and had no problem getting in (i.e. doors opened at 7). I found a great spot a few people away from the stage. 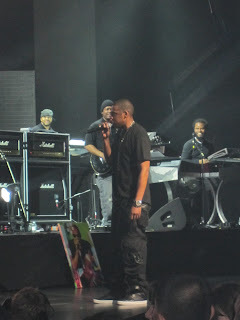 Jay-Z is interesting in that he has both men and women who want to be up close to the stage. ****Earlier in the week, I sold the other concert ticket that I had for $300 (i.e. not too shabby, since face value was about $150). Trey Songz came out and did his thing. 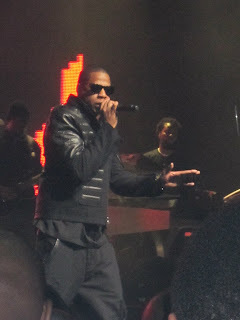 Jay-Z's ETA started at 10 minutes (i.e. at other shows, it started at 20 minutes). The seats in the risers didn't look full for the sold out show, which led me to believe that people who had actual seats decided to join the rest of us on the floor. 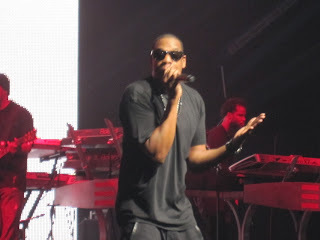 Jay-Z did his set, and it was better than the show in DC. Why? Because Jeezy wasn't there. A fun surprise was that Stevie Wonder was in the crowd, by the stage, taking in the show. You know you're doing something well, if Stevie comes out to see you! After the show, the cab line was ridiculous, so I went to the craps table to kill time. The lowest table minimum was $15 and after 3 shooters who made a point and then proceeded to crap out after setting another point, I was "over it" and decided to head back to Caesar's. I played until about 3AM (i.e. 4AM with the time change). I kept trying to get to $1500, but luck wouldn't let me. $1200 is where I topped out (i.e. including my $400 withdrawal). C'est la vie... It's good to be in the black (i.e. I made my money back, covered my NYC expenses, and have some extra play money). I can't believe I forgot to mention Manny Pacquiao. 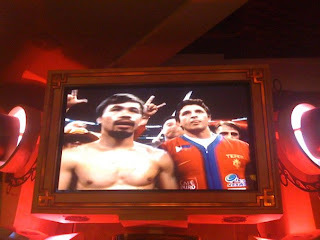 Along with most of the casino staff, my friend and I watched the Pacquiao v Clottey fight on the TVs (i.e. along with everyone working on the casino floor). We all stood around the TVs and gaming practically stopped. The fight went 12 rounds, and Pacquiao threw 1200 punches. Manny won every round by a score of 10-9. Yeah, Manny!!! Now, can we please have a Pacquiao v Mayweather fight?!?! The Hoyas are tough. They will beat WVU in the Big East final. I saw them play against Duke earlier this year at the Verizon Center and they dominated. 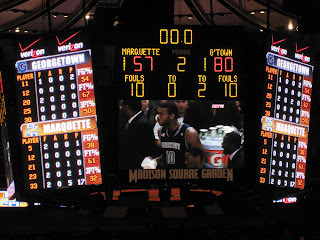 Tonight, they crushed Marquette. The Georgetown Hoyas are for real (i.e. if they continue to play with intensity and maintain their focus). Marquette kept it close in the 1st half. Check out the Hoyas' shooting percentages. Wow! This year is the 25th anniversary of Villanova beating Georgetown in 1985. That game changed my life. I watched it while at Snowshoe, West Virginia. We were at our condo for a ski trip, and my father had sent my brother and I to bed. However, I couldn't help but peek through the curtain and watch the TV from my bunk bed. My dad must've heard me screaming in vain for Ewing and the Hoyas to pull off a victory, because he let me watch the end of the game with him. We all know how it ended. It was not pretty. 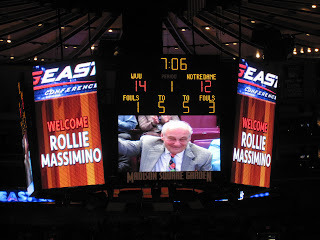 Rollie Massimino was at The Garden tonight. I'm sure he's a good man. However, I cannot allow myself to root for Villanova. Actually, I would never go to Cleveland State to watch a basketball game when he coached there. Coach Massimino's strategy to slow down the offense worked in 1985, and he broke my Hoya-loving heart. Seeing him tonight, brough it all back. I'm not alone. The minute he was shown on the screen, all the Georgetown fans around me started groaning and all you could hear was, "85"... It was the best of times, and it was the worst of times ~ depending on who you were rooting for. Regardless, people remember it. WVU is good, but there's something missing. It seemed like such a slow game against Notre Dame, but WVU hit a few 3s to resurrect the memory of Kevin Pittsnogle in my brain. Yes, I said - Pittsnogle... Don't question my basketball knowledge/memory. I'm fierce. Plus, can anyone forget when WVU upset Wake Forest in 2005? I can't. It was INCREDIBLE. I was in NYC, at my brother's apartment. Do you know where that game was played? It was played at Cleveland State. I remember the day like it was yesterday. Like I said, don't question my basketball knowledge/memory. I don't know if WVU is young ~ but they play young and seem to make mistakes. This was my first time watching them, and I saw guys that thought they had their bunny shots/lay-ups made, so they finished sloppily and/or missed. Yuck... Missed bunny shots make me think of only one person. The New York Knicks' Charles Smith. He missed 4 lay-up/bunny shots at The Garden, when the Knicks had a chance to take a 3-2 lead in the 1993 Eastern Conference Finals ... Ugh ~ I don't want to type about it. The memories give me heartburn... 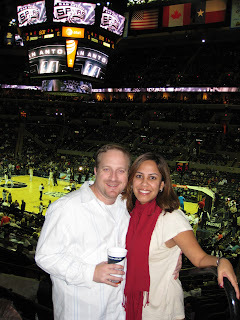 I actually met Charles briefly earlier this year at NBA All-Star Weekend in Dallas. I congratulated him on a great career. It was the humane thing to do. 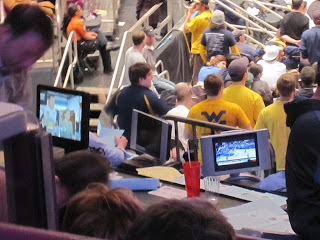 There were moments during the game when I thought Coach Huggins' head was going to explode. When one of the WVU players should've dunked, but instead went for a lay-up and missed, I instinctively "ducked and covered" (i.e. as if I were at a Gallagher show and he was about to crush a watermelon with that carnival hammer). Honestly, I would've bet cash money that Huggins' head would burst and the game would have to be called. I bet people, who were watching at home, started trying to adjust the color settings on their TVs. It's not right for someone's face to turn that red. That player is lucky that WVU won. I never really paid atttention to the Mountaineers until tonight, but there was no way to miss the fact that that they play(ed) a 1:3:1 defense. I wonder... When I was in junior high, we learned how to play man to man, and zone.. We learned and played against both 1:3:1 and 2:3. 2:3 zone defense will always be one of the things I associate with Syracuse. Who beat Syracuse earlier this week? Yes, Georgetown did. FYI ~ Syracuse is also the real deal. If I had to guess right now who'd go farther in tourney when March Madness really begins, tonight I'd pick Syracuse. However, ask me again after Selection Sunday, and I take a look at the brackets. I love to people watch and watching old drunk men yell at each other after/during games makes me laugh. They look foolish, but they can't seem to help themselves. After the doubleheader two, 50ish silver foxes were yelling and getting into each other's faces on the courses. Who knows what got their Wranglers in a bunch? But, leave it to some college kid to yell, "Kick his a**, Sea Bass!" I literally laughed out loud. I only heard "Eye of the Tiger" by Survivor, ONCE!!! Yeah!!! Over by the media tables, there are TVs. People can change the channel on these TVs. I kid you not. Someone preferred to watch Talladega Nights as opposed to part of the 2nd game. Does that tell you anything? And if you're not geared up for March Madness, here you go!